It’s heerree, the day for Lovers or soon to be Ex-Lovers, depending on the level of drama you enjoy in your life. As far as we can tell, you should know your Valentine well enough to give them an appreciated token of your love without our help. However, the amount of discarded Valentine’s Day gifts we see in thrift stores says otherwise. That would save on precious resources and money, discourage the proliferation of these things, and save your honey some anguish when they realize that they already have 15 of these stuffed animals, and need to get rid of a few. It’s a slam-dunk present for someone with a wacky monkey collection–not so good for anyone else. Those are candy-shaped soaps! If chocolate soap isn’t the meanest thing ever, we don’t know what is. Every time you use one of those soaps, it would make you hungry for a piece of candy! We couldn’t tell for sure, but they probably smell like chocolate too!!!!! It’s surprising that the recipient of that gift didn’t stomp on that package until they used up enough calories to eat a chocolate. You still have to have some shopping savvy–one of these works, and one doesn’t. 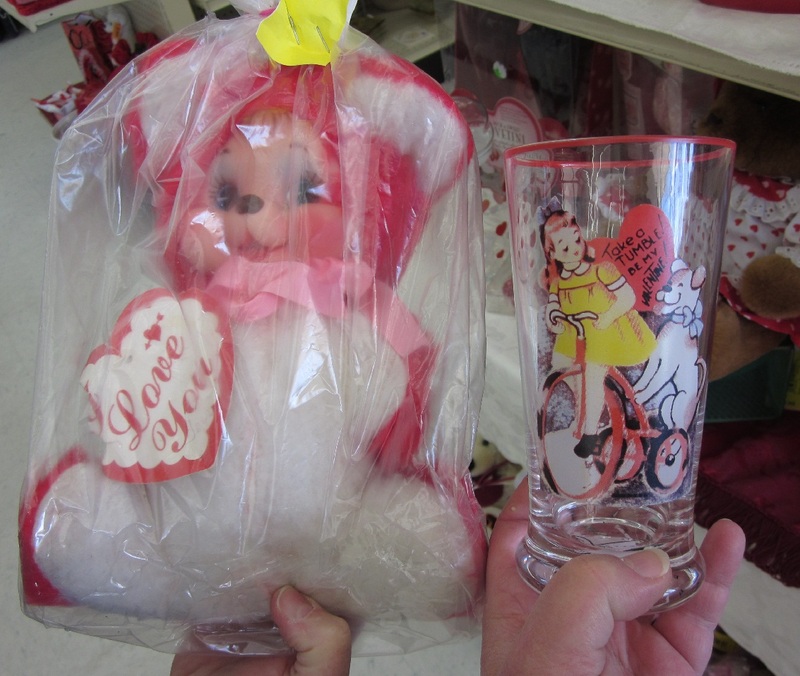 In fact, the glass with the reproduction of a vintage valentine is much cuter than the bear, even if it’s new. It’s a mystery to us why people panic and buy these kinds of Valentine’s presents. Your lover probably would appreciate: a thoughtful card, flowers, candy, uncomplaining help with repetitive chores, kindness and consideration on a daily basis, a special meal of all their favorites, one uninterrupted hour of a relaxing activity (you fill in the blank) guilt-free, an evening of your undivided attention while holding hands … we could go on forever, but hopefully you get the drift. 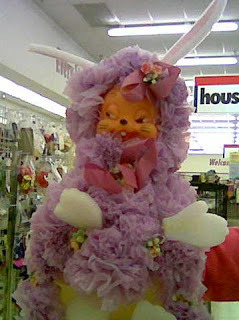 Of course, there are people out there who want the stuffed animal, crazy monkey, or faux chocolates. 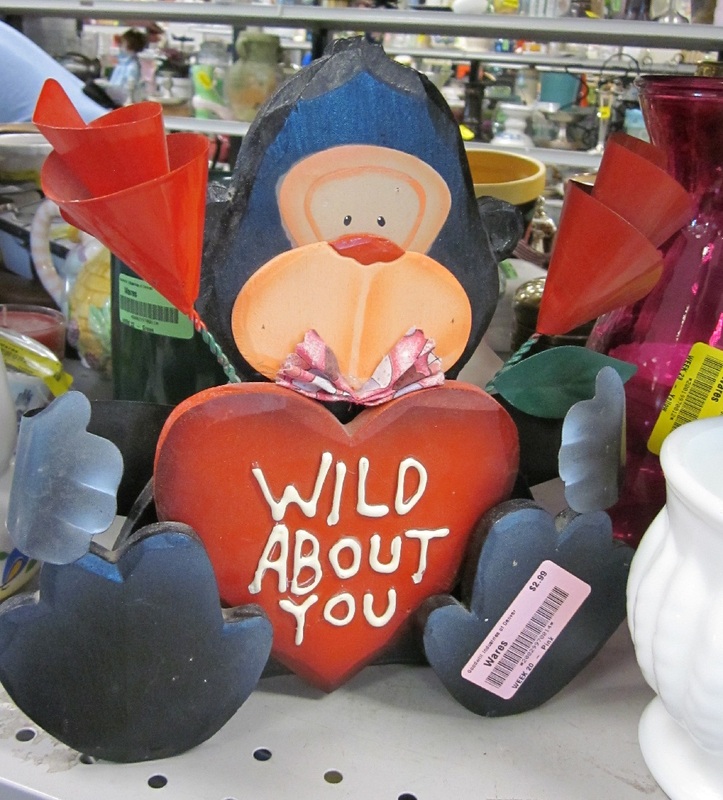 To them we say: Send your sweetie to a thrift store, there are tons of what you love, to be had for reasonable prices. Here’s hoping that your Valentine’s Day is a happy one. We hope you take the opportunity to tell your loved ones, no matter who they might be, that you appreciate them. This entry was posted in Holidays and tagged Holidays, Valentines. Bookmark the permalink. 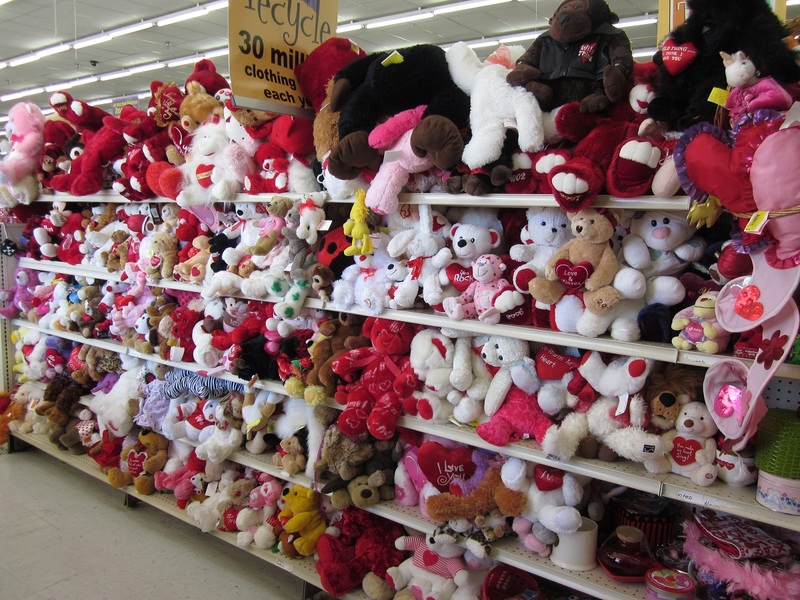 Wow… the shelves loaded with stuffed animals. Truly a testament that some love is temporary or at least can’t be bought by a $5.95,sappy-eyed, plush covered piece of Chinese import. True dat! It seems like a waste that the retail stores are full of the same thing, which will end up at the thrift stores, etc … Wish those stuffed toys could go somewhere to be loved and appreciated. 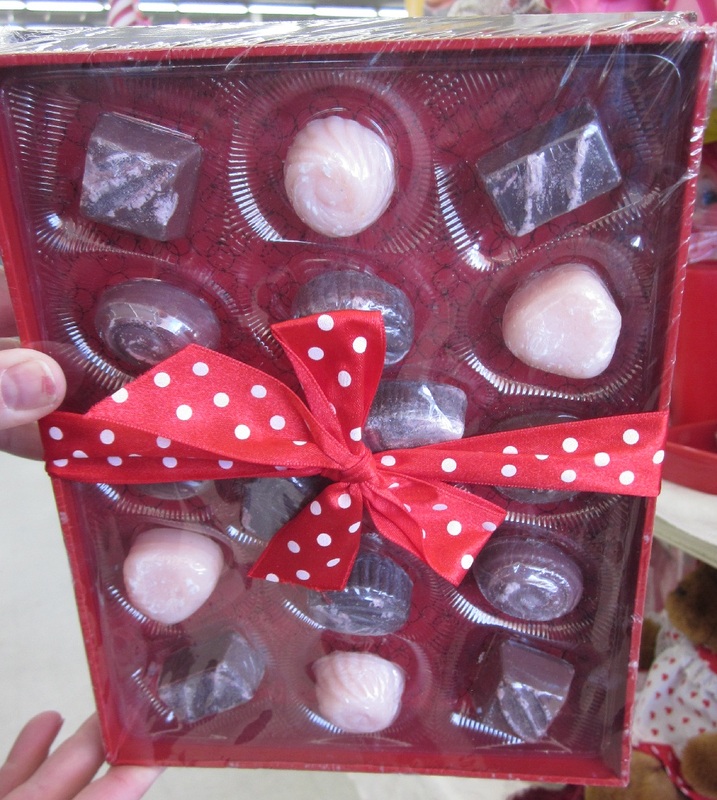 Most men need training in what to give for Valentine’s Day and other events. The first lesson I gave hubby was – no stuffed animals. Hope your Valentine’s Day is lovely. We’re with you–nothing but a card is so much better than one of those Valentine’s Day stuffed animals. We suspect they are so common because they are easy; saw some stocked right next to the cards at the supermarket. Thanks for the kind wishes, hope your Valentines Day is smashing. You know what they say about the way to a man’s heart. Thank goodness it’s a delicious thing; we HAVE seen food at thrift stores before! From now on, we will think of you and your doggie friends when we see these!! Now if everyone would just take ten of them home and do the same, the infestation would be under control!